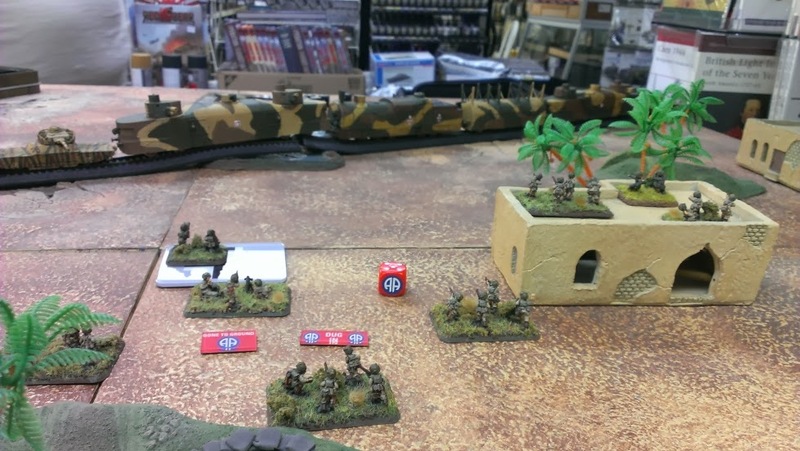 When I had finished my Airborne Americans for Historicon this past year, I had full intention of getting some more games in with them to finish out 2013. Playing with more of an 'infantry' based list allows you to try more things in both defensive and attacking roles. 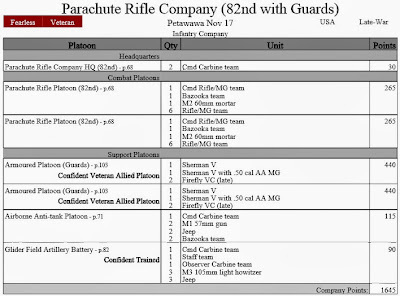 I learned a lot more about the game and my abilities to come up with tactics, deployments, strengths and shortcomings of my 82nd w/ Guards. 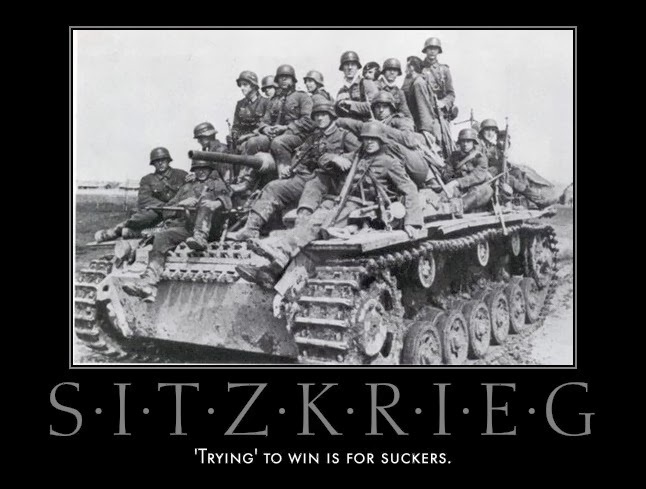 The biggest thing being talked about at tournaments in 2013 has still been 'Sitzkrieg', which is still an issue for some. I've always been of the opinion, you can not win as an attacker, unless you do EXACTLY that. Sitting back and using artillery or aircraft to win a game is not going to happen, and sitting around until turn six waiting to lose is not an option either. Look at it like you have already lost unless you do something about it! 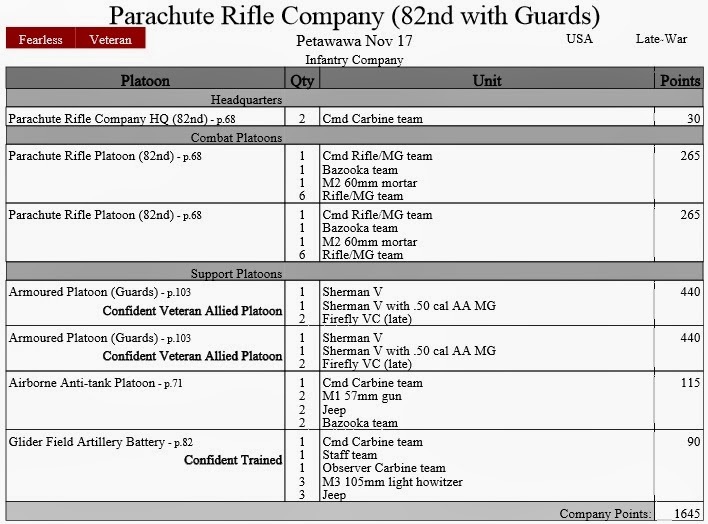 In November, a few of us went up to Petawawa for a Late War tournament. My goal was to come back and have a writeup of my games and post some pics, but the holidays were fast approaching and having some renos of my own to do, I simply did not have the time. Though I did take some pics of the games I played. Using the new 1650 point limit that has come down from Battlefront, my list was fairly balanced. I will likely work a little more on this list after I decide what else to paint this coming year. I only have two resolutions I want to concentrate on in 2014. The first one is to assemble and paint an armored list, something like Canadians, heavy armored Brit squadrons or maybe even a German Panther Company. We've talked about an all out 'tanks only' list tournament. 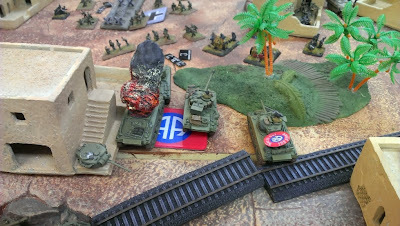 I'll have more on this when the time comes, for now here are some of the pics from the Nov. 17th tournament that was hosted by Perkins' Hobby's. With the temperature dipping down to nearly -40*C with the wind this week, stay inside, play some CoD:Ghosts and do some painting! Talk to you soon. 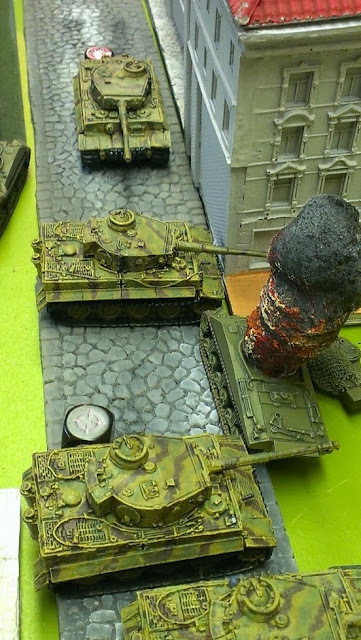 Sherman roadblock crushed by Tigers! All aboard!!! Next stop, El Alamein! 2014, A whole new year of Empty Promises!